The Saifu Team is out and about. In the next two months, Saifu team members will be participating in two global conferences, spreading the word about Saifu and connecting with other like-minded people who are part of the crypto revolution. First, on April 23–24 we’ll be at the 2018 Crypto Affiliate Conference — CRAC.2018 — in Prague. CRAC is hosted in Prague’s largest exhibition center, the Výstaviště Praha, and will bring together hundreds of industry players from the crypto and affiliate marketing worlds. At 13:30 on April 24, Saifu’s Head of Communications Zach Murray will be speaking on the challenges of cryptocurrency adoption, and how Saifu helps to overcome those challenges. The first Crypto Affiliate Conference was held last year in Prague on October 30–31. It was a huge success with over 700 guests from the affiliate and crypto industries and prominent speakers from both communities. This year’s CRAC promises to be be even bigger, and a great opportunity for Saifu to educate, learn and connect. We’re proud of our unique, bank-grade approach to crypto security and we want to share it with the world, especially with people from our home market of the Czech Republic. CRAC gives us the opportunity to meet with future Saifu users, to hear what they want in a platform like ours, and answer any questions they might have. It also offers us the opportunity to meet with potential investors and ICO participants. The CRAC organizers expect upwards of 5,000 attendees this year, and we’re hoping to meet each one. 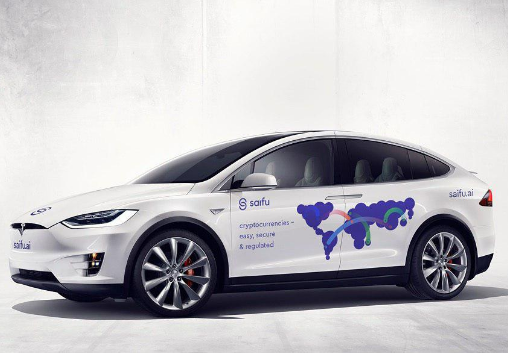 Saifu will be hard to miss, with our Saifu branded Tesla X, pictured below. We’ll also have several Saifu reps making the rounds and handing out gift cards worth 20 Saifu Tokens to anyone who signs up for the Saifu Beta (giveaway is limited to EU citizens and residents). You can learn more about the event on the CRAC website, and if you’d like to join us at the conference, you can save 50% by using our promo code SAIFU50 when you checkout. Get your tickets here. Saifu Open Beta is Live!